Images from the Mars Orbiter Camera aboard NASA's Mars Global Surveyor capture a faint yet distinct glimpse of the elusive Phobos, the larger and innermost of Mars' two moons. The moon, which usually rises in the west and moves rapidly across the sky to set in the east twice a day, is shown setting over Mars' afternoon horizon. Phobos is so close to the martian surface (less than 6,000 kilometers or 3,728 miles away), it only appears above the horizon at any instant from less than a third of the planet's surface. From the areas where it is visible, Phobos looks only half as large as Earth's full moon. Like our satellite, it always keeps the same side facing Mars. The tiny moon is also one of the darkest and mostly colorless (dark grey) objects in the solar system, so for the color image two exposures were needed to see it next to Mars. The faint orange-red hue seen in the wide-angle image is a combination of the light coming from Mars and the way the camera processes the image. 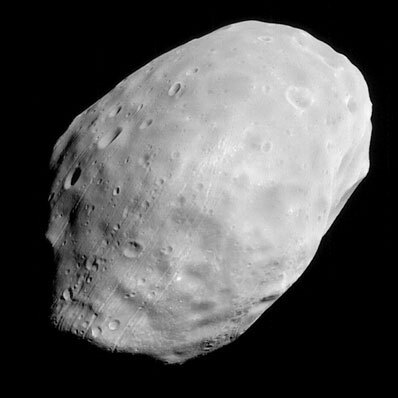 The top picture is a high-resolution image that shows Phobos' "trailing" hemisphere (the part facing opposite the direction of its orbit). At a range of 9,670 kilometers (6,009 miles), this image has a resolution of 35.9 meters (117.8 feet) per pixel. The image width (diagonal from lower left to upper right) is just over 24 kilometers (15 miles).